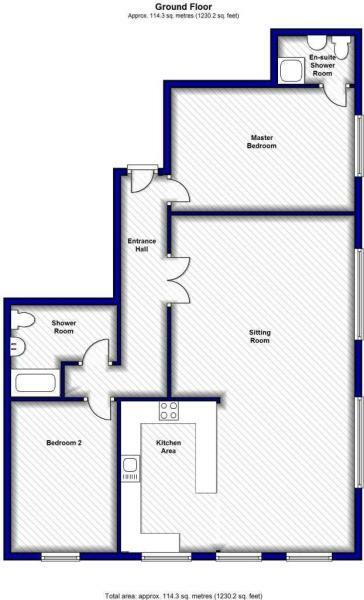 OPEN PLAN LIVING AREA: 29’4″ (8.94m) max x 20’8″ (6.30m) max Narrowing to 14’1 : Laminate flooring, built in shelving, recessed light points, secondary glazed feature windows to dual aspect, original archways, coving and cornicing, tv point, radiators. KITCHEN AREA: 13’0″ x 7’1″ (2.16m) max: Modern fitted kitchen with wall and base level units, integrated fridge / freezer, washing machine, inset cooker with four ring gas hob with extractor hood over, single drainer sink unit with mixer tap over, breakfast bar, tiled floor. EN-SUITE SHOWER ROOM:6’6″ (1.98m) x 4’2″ (1.27m): Double shower cubicle, close coupled WC, pedestal wash basin, part tiled walls, tiled floor, wall hung heated towel rail, shaver point, recessed lights. BEDROOM TWO: 11’8″ (3.35m) max x 8’9″ (2.67m): Secondary glazed window to rear aspect, built in wardrobes, radiator, picture rail, recessed ceiling light points. FAMILY BATHROOM: 7’7″ (2.31m) max x 5’6″ (1.68m) narrowing to 4’1″ (1.24m): Panelled bath with shower over, back to wall WC, pedestal wash basin, part tiled walls, recessed light points. Search all properties Available from McKinlays Bournemouth on their dedicated website. Or you can contact us Via the form below and we will respond to your enquiry.